The Blue America contest for Alan Grayson is still going strong. It ends Saturday. 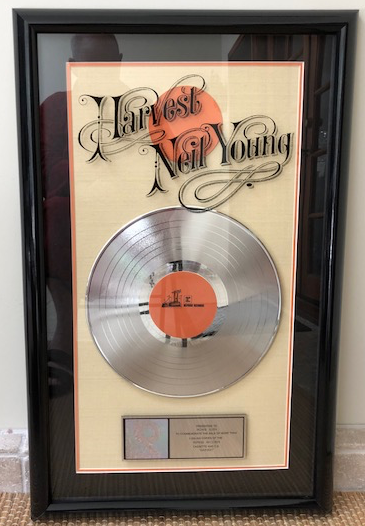 We're giving away a very rare gorgeous RIAA-ceritfied double platinum award for Neil Young's HARVEST, his 4th studio album (1972). Just contribute any amount to Alan Grayson's congressional campaign on this ActBlue page. That makes you eligible to win, regardless of how much you give. All the arcane FEC rules are here, if you have the mind of a lawyer. There were very few of these plaques ever made-- just to band members, people who work for Neil a few people at Reprise Records who helped promote Neil's music. You can be as rich as Trump and not be able to buy it. It's not commercially available. But you can win one. Someone will. At a slightly earlier moment in the space-time continuum, Neil Young wrote a song that seems very apt at this moment. The song is called "Let’s Impeach the President." He wrote it regarding an earlier awful President, not the current awful President. But most people whom I know think that this one is more awful than that one-- by a wide margin. Read the lyrics, listen to the case that Neil Young made for impeachment, and ask yourself: Doesn’t Donald Trump deserve it even more? 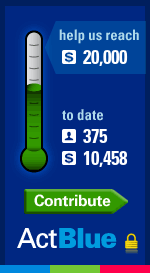 One more thing, if you've become used to click on a fundraising thermometer to make your contributions, we have a Blue America Harvest thermometer for you too. Please think for a second about how this isn't just about a contest... it's also electing someone to Congress who's shown us what he can do. Remember Alan in the well of the House, Republicans going absolutely nuts on the floor: "The Republican healthcare plan: Don't Get Sick... If You Get Sick... Die Quickly!" They yelled and screamed he should retract that and apologize. There were even establishment Democrats who asked him to do what the Republicans asked for. You know, he never did, right? That's not Alan Grayson. He'll apologize when he makes a mistake; that was no mistake! It wasn't then... and it isn't now. Grayson would be just ok back in congress. He'll be as impotent as the rest to supersede the Pelosi/hoyer/// money cabal... but still ok. He'd be better if he would stand up and speak honestly to the corruption and corrosion of that cabal... but he never has so far... so I wouldn't expect him to be useful in that way. So... just ok. lesser evil. about all you can say. Greyson lost a lot respect from me. A brilliant pit bull on the 'house' floor and that is where he should continued to focus and stayed -'the house floor'.Opportunistic greed (that U.S. Senate seat) that he dreamed about, only to have the greedy fire quenched by the DCCC in the primary. Gonna be an upward climb to get back into the House, maybe the winds of the 'blue wave' will blow in his direction. After Grayson got stomped by the DSCC, I wrote him and asked him to consider remaining in the House since he can clearly win and keep a seat. We'll see if he heard me. And as 11:37 points out, he left a huge void in the opposition to the Nazis via his absense. As a result, he's classified by me as belonging to the Carlos Danger group of Democrats who let us down by being out of position when they were needed due to personal foibles. 7:33, even when he WAS THERE, he refused to openly address the corruption, duplicity, ineptitude and cowardice of his own party and their bought and paid for leadershit. His rhetoric on issues is just fine. But his silence on the evils of his party is even more deafening.